Tanner Kline is a ‘Sweeper.’ It is his job to protect the uninfected from the infected. In this post-apocalyptic setting there are really only the two factions – those infected with the Gabriel Virus, referred to as “Spewers” because of the way their sores tend to eject pus, infecting others, and there are those who have not been infected by the Spewers, the Clear-Skins. Tanner and his kind have completely de-humanized the Spewers as nothing more than animals who are a danger to the rest of humanity and therefore must be destroyed. But Tanner is captured by a band of Spewers and taken back to their settlement. While it is clear that the Spewers fear and hate the Sweepers because of the destruction they bring, Tanner comes to a very difficult realization … the Spewers are human. Even though the Spewers live in the woods, they still live in communities and band together the way the Clear-Skin do, and they treat one another with respect. In fact, the Spewers may behave more humanly than do the clear-skins! This is a short book, a novella, and author William Todd Rose keeps the action moving swiftly. The story is told from alternating viewpoints, which also moved the story along nicely. The book does seem to lead us into a place of recognition and redemption, but given the title – which may seem a little strange until you read the book – it shouldn’t be a surprise that this story is about the worst of humanity and not the best. I really like the idea of big publishers putting out shorter works as ebooks – as long as they are priced appropriately. It gives the reader a chance to sample more authors without committing either money or time in long books, trilogies, or series’ now. The ebook format is perfect for this. I do recall, during my various days working in book stores, that publishers have periodically published novellas as paperback books, but it never quite caught on. For those who like the horror market and/or dystopian fiction with a dark nature to it, then this is a great little novella that you can sample and enjoy. Looking for a good book? 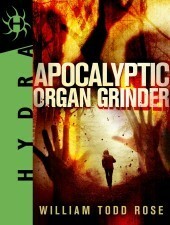 Apocalyptic Organ Grinder, by William Todd Rose, is a dark, graphic novella of how humanity has lost its compassion.